Sloths are slow-moving mammals that live in the rain forests of Central and South America. These tree-dwelling herbivores spend the majority of their time hanging from the branches of the trees they live in and feed on. While sloths live in the branches of many types of tropical trees, their preferred one is the cecropia tree (Cecropia spp. ), sometimes referred to as the sloth tree. Of the planet's six sloth species, four are three-toed (Bradypodidae) and two are two-toed (Megalonychidae). All sloths live in the same habitats, feeding on similar types of trees. Two-toed sloths tend to only be active at night, while three-toed sloths are active day and night. Three-toed sloths eat fruits, berries, leaves and shrubs. Two-toed sloths eat a similar diet, but will also eat small rodents and insects, according to BioExpedition.com. 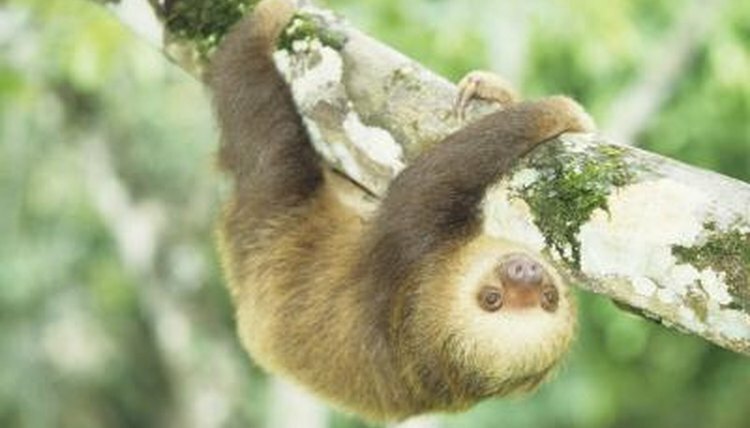 All sloths live in the canopy of trees, moving from one to another by climbing among their branches. Sloths usually come down from their trees to eliminate around once per week, although you may also find them swimming in bodies of water near their trees. Sloths feed on and may live in more than 25 types of trees, according to Montclair State University. The main tree that they live in is the umbrella-shaped cecropia, which is why some call it the "sloth tree," according to Animal Planet. Sloths also nest in the crowns of tropical palm trees because they can blend in among the tree's coconuts, camouflaging themselves from potential predators, according to the World Animal Foundation. This keeps them safe while they sleep from between 15 to 20 hours each day. The pygmy three-toed sloths (Bradypus pygmaeus) live on the Isla Escudo de Veraguas, off the coast of Panama, where they live and feed on the island's red mangrove trees, the Evolutionarily Distinct and Globally Endangered Species website states. Where sloths choose to live dependents partly on what the animal enjoys eating. Pregnant sloths feed on the leaves of both the Lacmellea panamensis and the Cecropia eximia trees, according to Montclair State University's website. Both of these trees provide acceptable habitats for sloths. In addition to the branches of the trees themselves, some sloths will also settle into lianas, tangles of woody vines that connect the canopies of various trees in the rain forest. These vines provide the sloths with good camouflage against predators and are sensitive to the vibrations caused by approaching predators, serving as an early warning system for the sloth. Preferences for types of trees sloths enjoy eating and living in pass through generations. Sloths tend to live solitary lives among the trees, seeking out others only for mating. Mothers live with their young for their first six months to two years of life before the youngsters go off on their own, usually in the same home range, according to the San Diego Zoo website. Of the six species of sloths in the wild, the maned three-toed sloth is classified as endangered, according to the World Animal Foundation. The main threats to the sloth are hunting and deforestation due to logging and agriculture. Animal Planet: Why Are Sloths So Slow? The Nature Institute: What Does It Mean to Be a Sloth?